The scooter war of attrition has begun in San Francisco. San Francisco officials passed a law in April limiting the number of scooters in the city. The law says that over the next year only five companies will get permits to put their scooters throughout the city. The number of scooters is also limited to 1,250 in the first six months. If that number of scooters works, the cap could increase to 2,500. Scooters have become a divisive topic in the Bay Area. The hoopla began after three companies -- Bird, Lime and Spin -- unloaded their e-scooters in San Francisco in late March without any forewarning to lawmakers or residents. Almost instantly, hundreds of scooters swarmed the sidewalks. Some locals rejoiced at being able to easily scoot block to block in the congested city. Other people complained that riders didn't follow the laws of the road and endangered pedestrians by riding on sidewalks and leaving the scooters wherever they felt like it -- blocking parking spots, bike racks and wheelchair accesses. While the city is processing the permits, no company is allowed to have its scooters on city streets. If the companies don't follow that rule, they could forfeit their chance for a permit. The SFMTA, which is issuing the permits, said it'll likely take until the end of June to finalize the permits. "The new permit and pilot was built to prioritize public safety, build in equity and focus on accountability," SFMTA spokesman Paul Rose said in an email. Uber, Lyft, Bird, Lime, Spin, Scoot, Razor, Ofo and Ridecell all confirmed they applied for the permit. The deadline to apply was Thursday. The other three companies -- CycleHop, Uscooter and Skip -- didn't return requests for comment. The San Francisco Chronicle first reported this news. 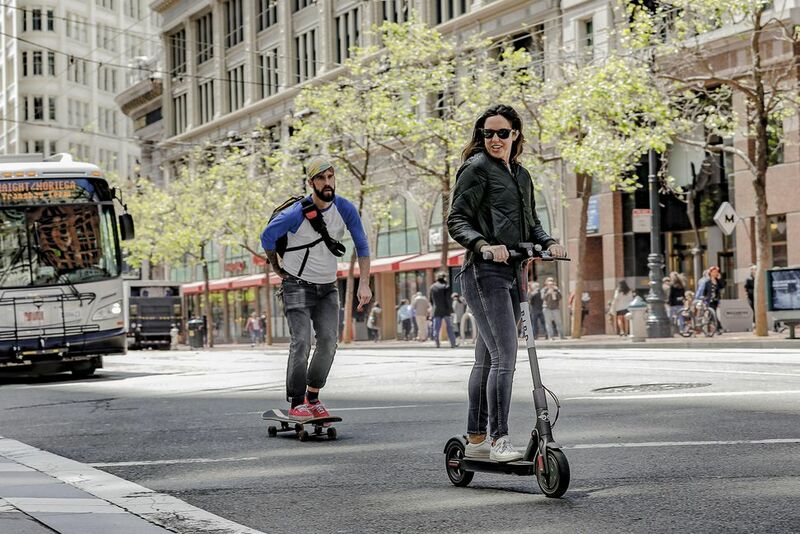 Of these 12 companies, seven are known to make or operate electric scooters -- Bird, Lime, Spin, Uscooter, Skip, Ofo and Razor. Scoot rents out motorized scootersthat look like mopeds but its CEO Michael Keating said the company plans to add kick scooters to its network. Unlike Bird, Lime and Spin, which don't supply helmets with their scooters, Keating said Scoot is looking into providing helmets with its rides. "Scoot aims to address safety and equity," Keating said. "We discourage riding on the sidewalk and work with groups like the SF Bike Coalition to determine reasonable rules of the road for bike lanes." Some of the companies that applied for the permit are already operating public bicycle rental programs, like Ofo, CycleHop, Lime and Uber. Lyft is rumored to be getting into bike rentals too with a possible acquisition of Motivate. Uber applied for the San Francisco scooter permit under its dockless bike rental company, Jump. The ride-hailing service said it plans to offer electric scooters as part of its new direction to become a complete transportation platform. "Bikes, perhaps scooters. I want to get the bus network on. I want to get the BART, or the Metro, et cetera, onto Uber," said Uber CEO Dara Khosrowshahi at Recode's Code Conference last week. "So, any way for you to get from point A to B." First published June 8, 1 p.m. PT. Update, 3:28 p.m. PT: Adds confirmation from Ridecell, Razor and Ofo that they applied for the San Francisco permit. Adds comment from Scoot CEO Michael Keating. Adds comment from SFMTA spokesman Paul Rose.